How Long Does Nicotine Stay in Your Blood? Nicotine is a stimulant drug that is found in tobacco products. There are thousands of chemicals in tobacco plants, and even more are added in the cigarette manufacturing process. But nicotine is the component that gives cigarettes their addictive quality. Nicotine is a naturally occurring liquid alkaloid that makes up about 5 percent (by weight) of the tobacco plant. Urine nicotine tests can detect the drug for up to 20 days, while it is usually shorter in blood tests. When you smoke a cigarette, you are consuming 1 mg of nicotine, which is enough to produce a stimulating effect on your nervous system. In a small dosage, nicotine boosts mood, improves memory and cognition, decreases appetite, relieves depression, and increases brain activity. After you inhale nicotine by smoking, it is metabolized in the body, so it can be detected in blood, urine, and saliva. How long does nicotine stay in your blood? Nicotine is usually detectable in a blood test for 1-3 days after the consumption of a tobacco product. * However, the length of time that nicotine stays in your system may vary based on how much or how often you smoke, and may also be affected by your age and general health. In addition, sometimes cotinine levels are used to determine nicotine’s presence in the body. Cotinine is what nicotine becomes when it is metabolized in the body. If this is the case, it can take 1-10 days. There are ways to effectively clear nicotine from your system, most of which include eating a healthy diet, drinking plenty of water, and getting exercise. If you are looking to get tested for nicotine levels, or you simply want more information or consultation on your tobacco use, FastMed Urgent Care would be happy to help. Our walk in clinics are open 365 days a year with extended hours. We also accept most major insurance plans so quality healthcare is available to you at a low cost. 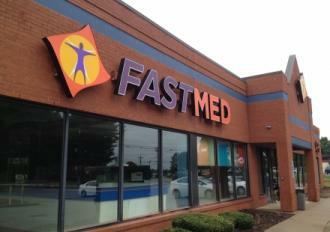 At FastMed, our mission is to serve our communities and patients with a high level of quality, personal care, affordable and convenient urgent care, family practice, and other specialty medicine services. Want more information? Visit our FAQ page!